Depending on the attire he chooses to wear, he could look the tech professional that he is..the mridangist drumming up a beat, which he occasionally is..or the pious and enlightened wise man in touch with the truth..which he always is! When in running gear he is a fine combination of all..technically precise, striding to a perfect beat and rythym of percussion, with the calm and control of a seer! Sankaran Annaswamy, is the ‘Do Gooder’ at Dream Runners. 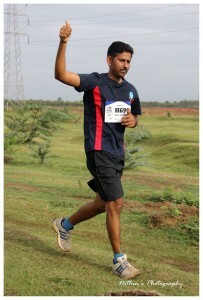 Ever the quite doer, Sankaran has played a huge role in inculcating the habit of service in team Dream Runners. In recent years, he has been the spearhead in getting the team involved in a variety of service projects and initiatives through the platform of DRHM as well as at other times. Most recently, team Dream Runners under his stewardship, played a significant role in rescue and relief operations following the Chennai floods. A reluctant beginner to distance running, the elation of hitting the finish line tape has made him take to it as a sport for which he now trains regularly and seriously. He has completed many half and full marathons. His best being a 2:04 at the Cool Runners HM in 2015 and 5:09 for a full marathon at SCMM 2015. Sankaran was the Race Director for the 2016 edition of DRHM and through his meticulous approach and calm disposition ensured that the event was a grand success!